Sold as part of the Ellis Collection at Dana Mecum’s 2009 Original Spring Classic Auction for $80,000 USD. Described as “1964 was a transition year for the Dodge Lightweight cars mainly involving the engine compartment. The season started with the 426 Ramcharger (the Max Wedge) (This car is one of them.) 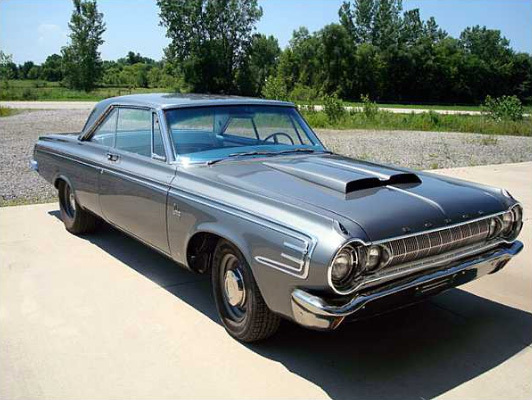 In February Chrysler introduced the 426 Hemi V-8 that was installed in the remaining ‘64 Lightweights. The lightweight aspects of the car were continued this year with a factory fabricated aluminum hood with a single inlet scoop, lightweight aluminum front bumper, fenders ,radiator support, lower valance and magnesium front wheels.. The rear bumper and the back half of the car was left in steel as they wanted as much weight as possible on the back half of the car. According to Galen Govier’s documentation only twenty-five (25) 1964 Hardtops with Aluminum packages were built and only 6 (six) are known to exist. This Special Order Aluminum Package car was assembled in Hamtramck, Michigan and delivered on January 26,1964 to Thompson Royal Dodge in Virginia Beach, Va. A rare and exceptional 1964 Dodge Lightweight Racecar.